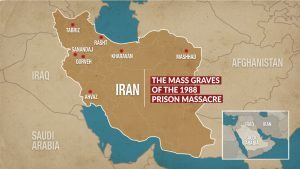 alaraby: Iran is systematically destroying the sites of mass graves where the bodies of thousands of political prisoners executed in a 1988 wartime purge are buried, a new report by Amnesty International claims. The mass executions took place at the end of Iran’s long war with Iraq, which began when Saddam Hussein invaded in 1980. By 1988, one million people had killed in a conflict that featured trench warfare, Iranian human-wave attacks and chemical weapons assaults launched by Iraq. Following a UN-brokered ceasefire deal, members of an Iranian opposition group based in Iraq – the Mujahedin-e-Khalq (People’s Mujahedin of Iran) – launched a surprise attack. Iran repelled the assault but the attack set the stage for sham trials of Communists, Kurdish separatists, Mujahedin-e-Khalq members, political prisoners and others that would become known as “death commissions”. Those who identified as “mujahedeen” were sent to their deaths, while others were questioned about their willingness to “clear minefields for the army of the Islamic Republic”, according to a 1990 Amnesty report. International rights groups estimate as many as 5,000 people were executed, while the Mujahedin-e-Khalq puts the number at 30,000. The joint report by Amnesty International and the London-based group justice for Iran calls new attention to the mass executions. While not largely talked about publicly since they took place, the executions made headlines in 2016 with the release of a recording of a top official at the time condemning the killings as “the biggest crime in the history of the Islamic Republic”. The audio recording triggered a chain of unprecedented reactions from high-level Iranian officials, who admitted for the first time that the mass killings of 1988 were planned at the highest levels of the establishment. Iran’s mission to the United Nations did not respond to a request for comment on the report. Justice for Iran alleges in the report that it has identified over 120 locations in the country it believes were used as mass graves then. The report focuses on seven sites for which the group says it has reliable testimony, photo and video evidence and satellite imagery. It says Iranian authorities targeted the sites in areas including Iran’s Gilan, East Azerbaijan, Kurdistan, Khuzestan, Khorasan Razavi and Tehran provinces in different ways. “The actions include: bulldozing; hiding the mass graves beneath new, individual burial plots; constructing concrete slabs, buildings or roads over the mass graves; and turning the mass grave sites into rubbish dumps,” the report says. Iran has never fully acknowledged the executions, carried out on Iran’s then-ailing supreme leader Ayatollah Ruhollah Khomeini’s orders, though some argue that other top officials were effectively in charge in the months before his 1989 death. Sadr said evidence that has since come to light, including a posthumously released recording by Grand Ayatollah Hossein Ali Montazeri, shows Iran had plans to execute prisoners years in advance and merely used the Mujahedin-e-Khalq attack as an excuse. “It’s very important for the families to see some sort of truth and justice after three decades,” she said. Reports circulated among family members that the prisoners were being executed in groups and buried in unmarked graves, with relatives frantically searching the cemeteries for signs of their loved ones. From 1988 onwards, Iranian officials informed families that their relatives had been killed but did not return their bodies or reveal the location of their burial. Most of those executed were serving prison sentences for undertaking activities such as distributing newspapers and leaflets, taking part in anti-government demonstrations and having real or perceived affiliations to opposition groups. To date, no Iranian official has been investigated or brought to justice for any of the extrajudicial executions. Some of the alleged perpetrators continue to hold political office or other influential positions, including in the judiciary and Ministry of Justice. Families have suffered repeated persecution and harassment from security and intelligence official for holding commemorative gatherings or decorating mass grave sites with memorial messages. One of the largest mass grave sites identified by the report was located on the outskirts of Behesht Reza cemetery near Mashhad, Khorasan Razavi province and is believed to contain the remains of at least 170 prisoners. Victims’ families told Amnesty International that cemetery employees and officials in Mashhad’s revolutionary court unofficially informed them that the bodies their loved ones had been dumped into three large trenches. Eyewitness accounts from 1988 of the area detail disturbed earth, raised mounds, and body parts protruding from the ground in the plots believed to be mass graves. Iranian authorities have consistently destroyed memorial signs and stones erected by families at the site and installed security cameras to instil fear. Since 2016, authorities have attempted to destroy two of the three burial sites at the cemetery, according to satellite images obtained by Amnesty International. Images from August 2017 show that construction work at the sites had progressed significantly, covering a major area of the mass grave under new structures. “Amnesty International and Justice for Iran are deeply concerned that, if the construction continues at this pace, all traces of the mass grave site will soon be hidden from public view and vital evidence that could one day be used to shed light on the number and identity of those forcibly disappeared and killed in state custody will be lost,” the report said. Evidence of a similar pattern of obfuscation was found at the other six mass burial sites documented by the rights groups. Amnesty called on Iran to “immediately stop the destruction and damaging of mass grave sites” and ensure they are preserved for proper investigations to identify the remains and circumstances of what happened. The group also called on Iranian authorities to cease the persecution of the families of victims and guarantee their rights to “truth, justice and reparation, including by conducting a thorough, effective and independent investigation into the extrajudicial and summary executions and enforced disappearances”.